A chef from San Francisco’s famed Slanted Door helped design the dishes at Em Oi. A Saigon-style riff on steak and eggs, and banh mi. Photograph courtesy of Em Oi. Ryan Ho, an IT consultant-turned-restaurateur, has one thing to say about Northern Virginia’s Vietnamese food scene—that it’s “frozen in time.” Stuck in the ‘70s and ‘80s, when many immigrants opened restaurants here.“People don’t realize how much the cuisine has changed,” he says. So, he opened Em Oi, a serene dining room in an Ashburn strip mall that started to slowly roll out last fall. His goal, he says, is to introduce people to a more modern take on Saigon cooking “beyond street food and simple eateries.” Think dishes like marinated tenderloin served sizzling over a hot stone, char-grilled duck with duck-fat hoisin, or oysters on the half shell dressed with ginger, chili, and mint. The first-time restaurateur had assistance from a Saigon-based restaurant consultant and a trio of chefs who helped create the recipes (one based in Saigon, one in New Orleans, and one from San Francisco’s lauded Slanted Door). They came for a month to test and refine the dishes. Chef Travis Obertach, who last worked at Rosslyn’s shuttered Bistro 360, is now running the kitchen. For all the modern inclinations, the best dishes I sampled leaned traditional. I loved the banh mi slathered with French pâté and chili aioli—it’s layered with luscious pork belly that’s been brined for a day and braised for hours. So too the cha ca la vong, a hissing skillet of catfish strewn with a ton of fresh dill, and the bun cha hanoi, a dish the late Anthony Bourdain and Barack Obama once shared. Not everything is so winning: that char-grilled duck was undercooked and tough when I tried it, and a pomelo salad with heavy on sweetly dressed greens and light on the fruit. Still, Em Oi’s pho is a soup I’d travel for. The rich broth is heavy on star anise and swims with thick noodles, Angus brisket, and tenderloin. 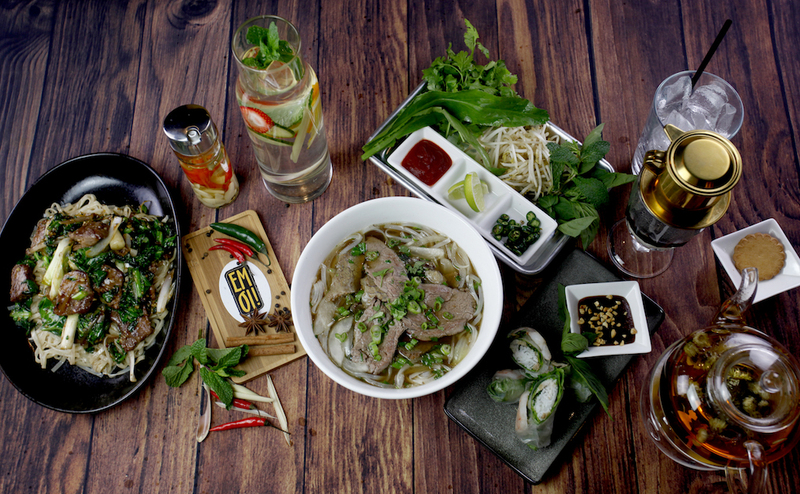 “It’s the kind of pho I’d get at the Park Hyatt when I went to Saigon,” Ho says. Em Oi, 20020 Ashburn Commons Plaza, Ashburn; 571-707-8727.